There are some weeds in the hoophouse even in winter. They grow in the walkways, and in beds where the vegetables were harvested in the fall but not cleared and replanted. Since there are lots of planted beds in there we can't just let the laying hens in: they will eat every green thing in there! So old fashioned hand weeding. And then feed for the cattle. Not all of the herd will eat the fresh greens, but enough do that it is worth while. 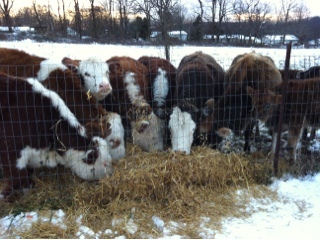 With snow covered fields the herd is also getting hay. 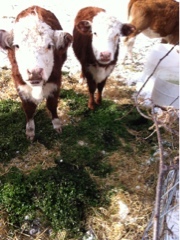 There is still plenty of pasture out there but it is harder to get to now, as both snow and ice cover the ground. Today we get some better looking hay for them, grown just around the corner. Country corner that is.